HomeHow To Change WordPress Default Login URL.How To Change WordPress Default Login URL. Do you have a blog or website on WordPress? 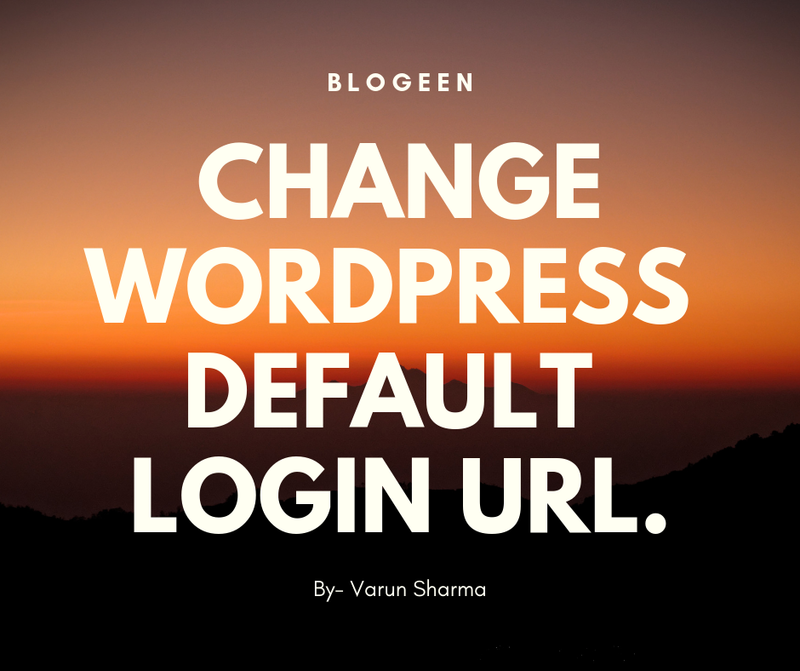 And want to make it secure by changing WordPress Default Login URL, then friends be with us and read our this post "How To Change WordPress Default Login URL." complete and carefully. So, hello everyone my name is Varun Sharma and today I am going to tell you How To Change WordPress Default Login URL. So let's start friends changing the login page URL of the WordPress site is not a hard task. You can easily change it with the help of plugin and you do not need any kind of technical and coding knowledge. Just enter the plugin's setting page and enter a custom wordpress login page URL. After changing your WordPress blog/website login page URL, when you enter for eg:- "https://Blogeen.com/wp-admin/" to log in to your site, you will see a 404 not found error page. Why It Is Important To Change WordPress Admin Login URL ? Any blogger or website owner is very important to keep your site safe and uses a variety of techniques for this, including changing the WordPress login URL. We know that the login page URL of all the WordPress site is the same and if the hacker knows that your site is on the WordPress platform, then he can hack your site using Brute force attacking. Brute force attacking uses hackers to use different types of user names and password combinations to log into your WordPress blog. However, there are so many free wordpress security plugins available in the market, which hide your WordPress admin URL. In this way, hackers can not find the login link of your site and the possibility of having brute force attacks decreases. Today in this article, I will learn to change the WordPress login page URL with the help of plugins which is very easy and changes your wordpress admin url in minutes. To change the WordPress admin URL, first you have to install and activate WPS Hide Login plugin in your site. After activating the WPS Hide Login plugin, click on Setting >> WPS Hide Login. Now the setting page of the plugin will open. Here you will need to add your custom wordpress login URL and click on Save Changes. You can see in the screenshot. Note: You can put anything in a blank space. For example, in the above screenshot, inhindihelp.com/login is now the new WordPress admin login URL of InHindiHelp. Now when a hacker or you enter "inhindihelp.com/wp-admin/" you will face 404 not found error. This way your WordPress login page security will improve considerably and it will be difficult to find your login page URL for hackers. This plugin does not rewrite or make changes of any type in your core file and does not add any type of rewrite rules. Conclusion:- Hello friends hope you like our post How To Change WordPress Default Login URL friends by following these steps you can easily change you WordPress Default Login URL. And friends it is also important to this so hackers can not easily hack your website. Remember to it is must to make your website or blog secure and safe. As i installed WPS Hide login plugin, able to do login with the changed url, but at dashboard i am getting 404 error. can you help regarding this?